I can probably name 15 local bartenders who can create and pour artisanal cocktails worth drinking. But no more. Like any city of comparable size, Atlanta is now awash in ridiculous concoctions bearing absurd names that mean absolutely nothing. On a first visit to a place where you don’t know the bar staff’s pedigree (a good rule of thumb: good chefs hire good mixologists), you’re probably better off ordering a gin and tonic than wandering in a territory where everything is a variation of a variation involving too many esoteric bottles, bitters, tinctures, and garnishes. 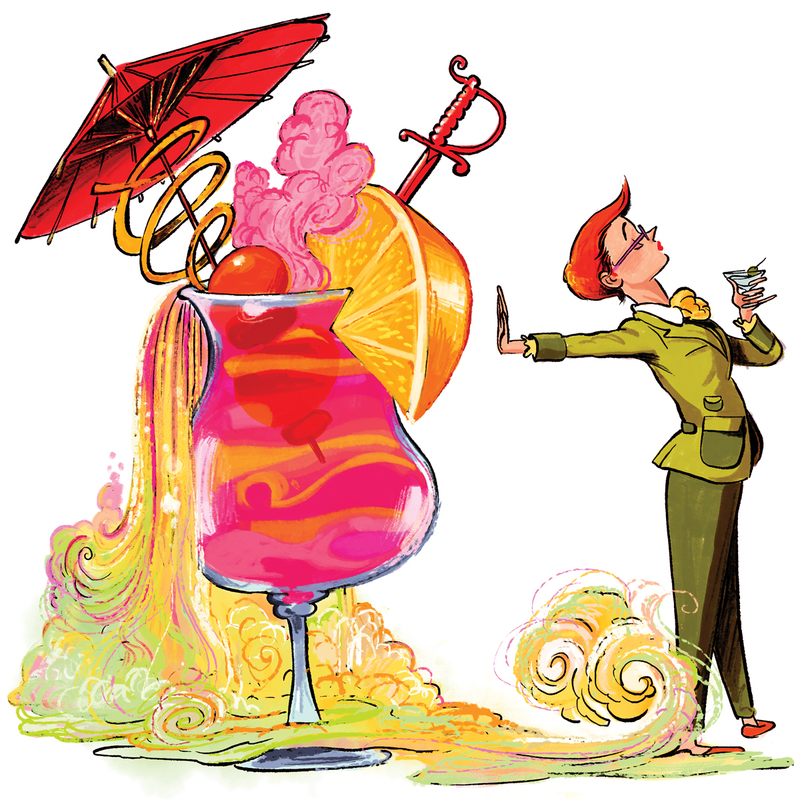 Many drinks pile on the ingredients with predictable results: a generic “cocktaily” taste and a color as unattractive as primordial ooze. Beware of words such as “rinse,” “float,” and “smoke” (techniques that belong only in the repertory of masters), avoid nontraditional botanicals and spices (which often throw a drink off balance), and forget thematic drinks in international restaurants. There is no such thing as an Istanbul mule or a Bangkok martini. Giving recommendations to frequently ungrateful out-of-towners is the bane of a restaurant critic’s life. How often have I heard, “I am coming to Atlanta; I want to eat Southern food”? Between the Southern restaurants that are too far off the beaten path, the ones that are open only for lunch, and those whose generic atmosphere does little to rep our region, there isn’t much to choose from. The restaurant I recommend on a consistent basis—because it’s aesthetically and culinarily relevant—is Kevin Gillespie’s Revival. And yes, I have to explain to those out-of-towners that the place that most embodies Atlanta isn’t within its city limits but in neighboring Decatur. Gillespie, who grew up just south of Atlanta and also owns the more highfalutin’ Gunshow, is easily one of our top 10 chefs. There is nothing forced about Revival’s classic romantic bungalow fronted by a large porch overlooking a lazy street. Inside, family memorabilia and old-fashioned furnishings give the restaurant a sense of place. There is a comfortable bar with appropriate Southern cocktails and a well-curated list of bourbons; the staff is hospitable; and, deep in the kitchen, chef de cuisine Nicole Edwards executes a menu the likes of which you’re unlikely to come across elsewhere. Anyone would be lucky to shake hands with the South through dishes such as deviled ham sandwiches, golden fried chicken, meatloaf wrapped in bacon, wedges of creamy cornbread, and, of course, mac and cheese—followed by peach hand pie or Gillespie’s notoriously delicious banana pudding.